Here in our hvac beginners ductwork section we will look at some common ductwork fittings and configurations. As discussed in our Hvac for Beginners page, each component of a forced air comfort system adds a certain amount of restriction to the airflow of the system. This restriction (friction loss) adds to the TEL (total equivalent duct length) of the system. 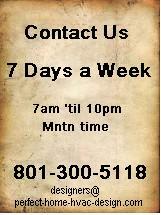 Therefore, the TEL of the ducting must be minimized for the best performing comfort system. It is not our intentions to train designers, but to emphasize the importance of a good design. For the Do-It-Yourselfer, we hope this hvac beginners ductwork section will aid you in installing a problem-free forced air system that you can brag to the neighbors about. Square ells, return or supply, are a bad idea. Each one in a system can add as much as 80' to the TEL. Rounded throats on ells drastically improve airflow, especially a rounded inside throat. The third example shows a return air base beneath the air handler / furnace. This is the best configuration, and mandatory if the unit has a 5-ton blower. The supply plenum sits directly on top of the AH/furnace or the AC coil in an upflow configuration. These two examples are very common for two-way duct systems. Example 1 with straight take-offs act the same as any square or right angle fitting. Air does not like to make quick 90* turns, therefore example 2 will give you much better airflow. Each straight take-off adds 80' to the TEL. Each flared take-off adds only 25' to the TEL. 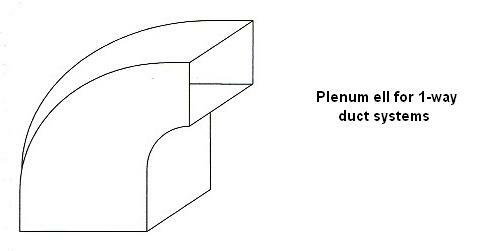 The plenum ell is the best approach to one-way duct systems. A one-way duct system can be where the equipment is placed at one end of the structure, or when the ducting feeds one-way out from a mechanical room to a tee which feeds two ways. Important! The output end of this plenum ell must be sized to deliver the full cfm (cubic feet per minute) called for by your Manual D calculations. 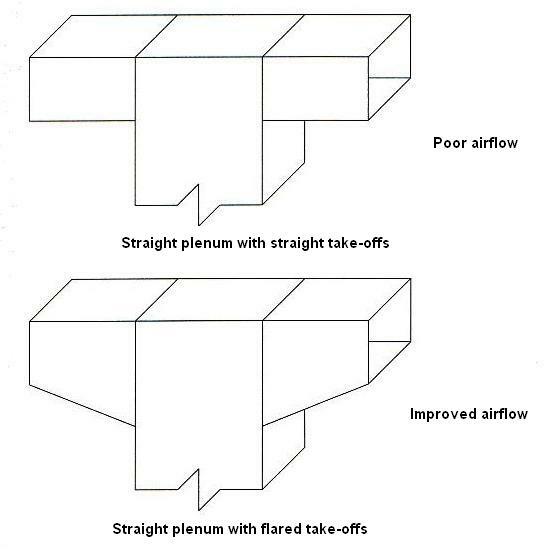 Proper air flow will usually entail flaring the plenum out to a larger width or depth to provide the needed cfm output. This can be accomplished with a standard reducer flipped upside down and used as an increaser. Rounded throats are a must in this configuration. A straight plenum with a flared take-off is not a good idea here. Residential HVAC Duct Drawings by Geoffrey R. Stoddard, Detroit, Mich.